28 gigs in 28 days! Apeiron Restraint la ut på en halsbrekkende turné i Sør-Norge fra 17. juli til 13. august 2011. Med på laget hadde vi band fra hele Norges metal-miljø. Som en omreisende festival fulgte to nye band Apeiron Restraint hver gang vi vendte tilbake til en by. Sju spillesteder i sju byer. 28 konserter på 28 dager; 800 mil på veien. Turneen var i stor grad selvfinansiert, Apeiron Restraint booket alle band og spillesteder selv. Bandet er sin egen label, sitt eget management og bookingbyrå. 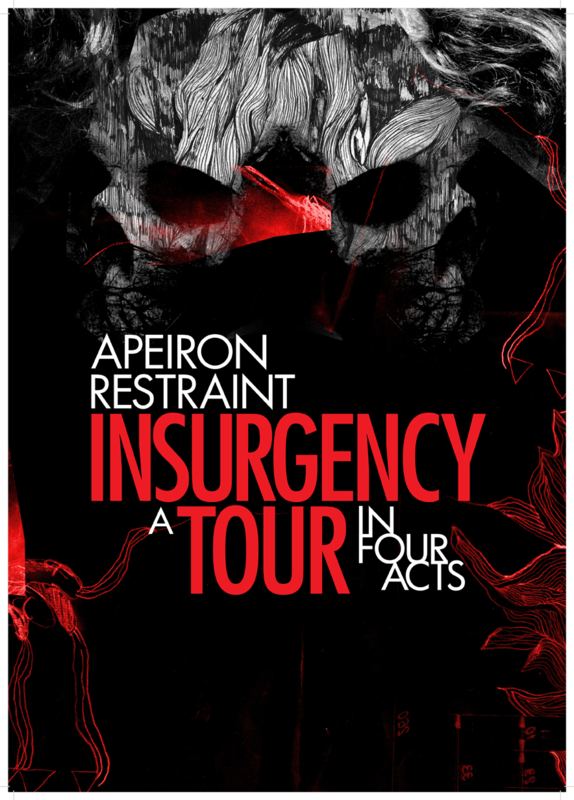 Apeiron Restraint commenced on an epic journey the summer 2011. Driving around the southern half of Norway four times, we embarked on the Insurgency Tour: A Tour in Four Acts. Joining us were twenty awesome bands from the Norwegian metal scene. As a nomad metal circus, two fresh bands joined us every week when the we returned to town. Seven venues in seven cities. 28 concerts in 28 days, 8000km on the road. The tour was largely financed out of the band members’ pockets. We worked as a label, management, and booking agency as we booked all the bands and venues our selves.